We've pulled out from the shelves three salutes to Halloween, that favorite holiday of creative kids. One is a Vermont classic: PASSING STRANGE: TRUE TALES OF NEW ENGLAND HAUNTINGS AND HORRORS, by Joe Citro. Our copy is the hard-to-find first edition hardcover brought out by Chapters in 1996. Second, Knopf recruited master of dark illustration Michael McCurdy for its 2005 volume of Edgar Allen Poe's TALES OF TERROR. Not only is the 90-page book crawling with creepy art, but it includes a CD narrated by Edward Blake, reading aloud "The Masque of the Red Death" (so appropriate as H1N1 flue spreads among us), "The Cask of Amontillado," "The Black Cat," and "The Tell-Tale Heart." 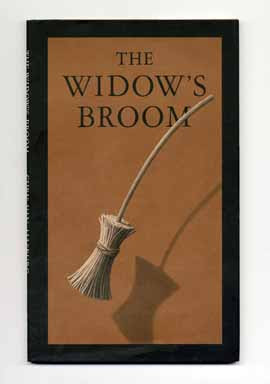 Third is a delicious signed picturebook we just nabbed: Chris Van Allsburg's THE WIDOW'S BROOM. Van Allsburg dated his signature 10-17-92 -- just a couple of weeks before Halloween, seventeen years ago. A gem. These are all listed at our part of ABE Books (click on www.KingdomBks.com and then choose Browse & Buy to drop straight into our listings). If you'd like a photo or scan to help your decision, all you need to do is ask (KingdomBks@aol.com). Tonight! 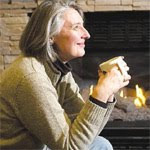 Louise Penny, Norwich, Vermont, 7 p.m. If you missed listening to and meeting Canadian mystery author Louise Penny last night in Montpelier, there's still time (if you're in northern New England) to get to her other Vermont event -- tonight at 7 p.m. at the Norwich Bookstore. Penny mentioned last night that she is in contract talks for her sixth through ninth books in the Chief Inspector Gamache series (originally labeled Three Pines mysteries, for the fictional Eastern TOwnships village where they mostly take place). The fifth book, hot this fall, is THE BRUTAL TELLING; Penny's first book is already nearly unavailable in hardover first edition. 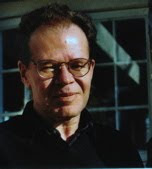 Franz Wright's reading last night at Plymouth State University (NH) celebrated his new collection, WHEELING MOTEL. From the wonder and exhaled prayer of "Kyrie" to the delicious humor of "The Soul Complains" and the ironies of "Professor Alone During Office Hours," the collection continues Wright's portraiture of happiness as it arrives almost as a surprise, after years of loss, anguish, and despair. He prefaced the poems with two new prose works, one set on a Rhode Island beach, the other titled "Paul's Song" -- these are from one of two new collections he's just completing (the other is poetry). Those will bring the total for this decade of his writing to six books, an amazing output. Because of his willingess to be frank, bear exposure, and take audience questions seriously, Wright enchanted the group last night. Don't miss the chance to hear and see him as he tours for this book. In the meantime, Knopf is offering a link that will give you readings of two of the poems "Wheeling Motel" and "Day One." If you think November fits the northern New England saying of "no sun, no snow, no-vember" there's a perfect poetry event coming up to light the season: On Thursday November 4 at Plymouth State University (Plymouth NH, exit 25 from I-93) meet the blues head-on with poet Kevin Young, at 7 p.m.; reception and signing follow.